To preface this post, I had just spent a few hours on this very post, and I lost it! Somehow it went into the black hole of the internet. :(:(:( There were tears. But, this one is going to be a little briefer because I am still sad over that massive bust. Bummer! I hope you are having a great start to the week! Sometimes technology makes me so upset. Sheesh. 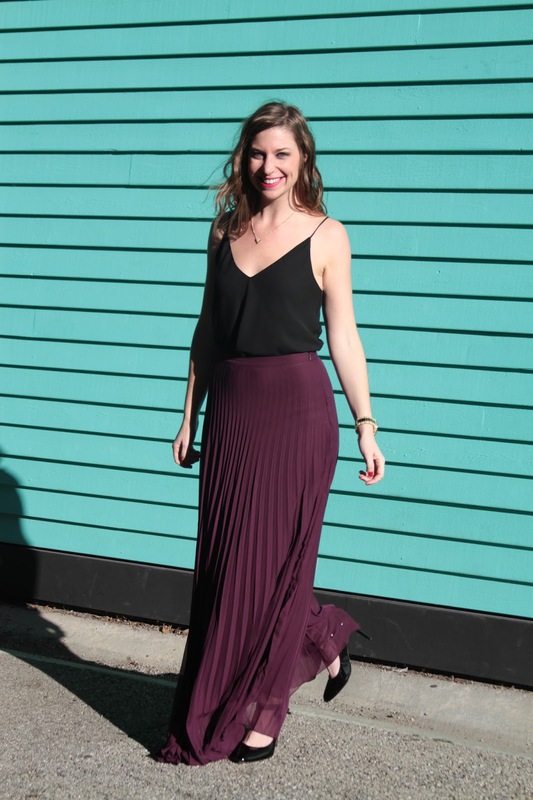 I was lucky enough to be invited to check out YM Boutique's new inventory a few weekends ago, and I fell in love with their maxi skirts and dresses. The above purple skirt is called the Zoey Maxi. It's only $48.75, and the best news? Even if you aren't near the YM Boutique locations in Aurora, IL or Geneva, IL, YM will ship to you! Follow them on Instagram @ShopYMB to get your orders in. You can also check out their Facebook pages, too! These jewel-tone maxi skirts are perfect for holiday parties! Tuck in a plain, strappy tank with your high-waisted maxi skirt. It's a super easy look to be holiday-party ready! My Levi tank has the best, strappy-detailed back-- not to mention, it's $22 at YM Boutique! The Mika Maxi dress from YM Boutique is $90 and such a stunner. How perfect would this be with a fur shawl or coat for a winter wedding? Check out these similar blush dresses below! The Needle and Thread maxi is a carbon copy of the YM Boutique Mika, but it's $279! You can't beat YM Boutique's prices. And, now that they ship, you can order from anywhere in the country! This might be my next purchase from Asos. Those ruffles and shades of pink? Pure glam!